Term 2, at the College of Dance, commenced on Monday, the 7th January 2019. The students were quickly back in the swing of life at the College. The faculty have been working hard on improving each students dance technique, increasing and improving student’s strength and conditioning and have been working with senior students who are preparing for auditions. We have also been focusing on learning and preparing some exciting new original choreographic works for the various performances that the College will be performing in during this term. The performance highlights in term 2 are Laois Dance Platform & Perform Ireland in the RDS. We were delighted to welcome some special guests to the College of Dance as we continue our program of exclusive workshops provided by International teachers and West End performers. 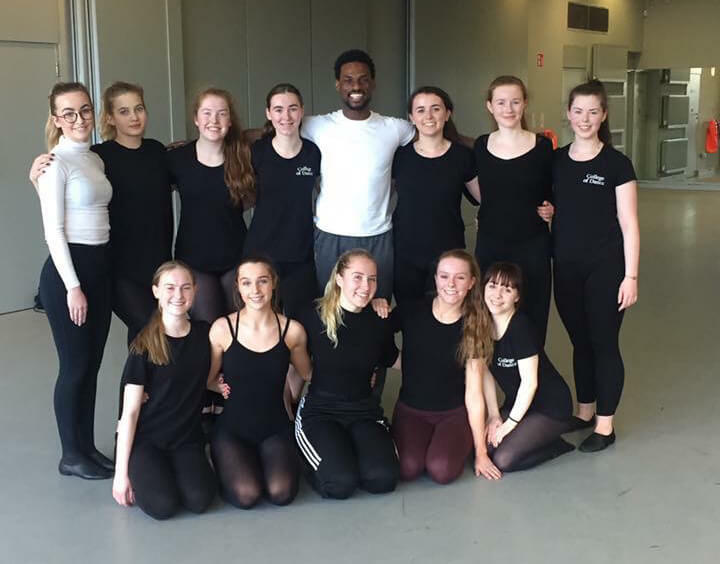 The first workshop was Brandon Sears who has appeared in Motown, Heathers & Come From Away, which was in Dublin performing at the Abbey Theatre. Brandon’s workshop was an invigorating and motivational jazz technique workshop. We will also welcome Robert Foley, originally from Cork, who is now Lecture of Dance & diploma course co-ordinator at the Institute of The Arts, Barcelona and Murray Grant from the MGA academy, Scotland. The College was also delighted to be especially invited to partake in Perform Ireland, which will be taking place in the RDS on Saturday 16th and Sunday 17th February 2018. The College will be on display for those two days at stand 413 if you wanted to drop by an learn more about the fantastic dance education we provide at the College. The current College students will be performing on both days, Samantha Lyons & Bernie O’Rourke will be holding masterclass workshops on Saturday & Sunday. Samantha Lyons, Bernie O’Rourke and Matthew Duffy, the College Dance’s Chairman, will also be hosting public seminars on the Saturday and Sunday. We are really excited about this event so please make sure to come along and say hello. Further details can be found on the Perform website – www.performireland.ie. Finally, we are excited to be holding our first audition for entry in September 2019 which will take place on Tuesday 19th February. If you wish to audition please download the two-page application form from our website’s ‘How To Apply’ page. Simple fill this in and return it with a passport photo and the €30 audition fee. Places for this audition are filling up fast so please get your applications in as soon as possible.